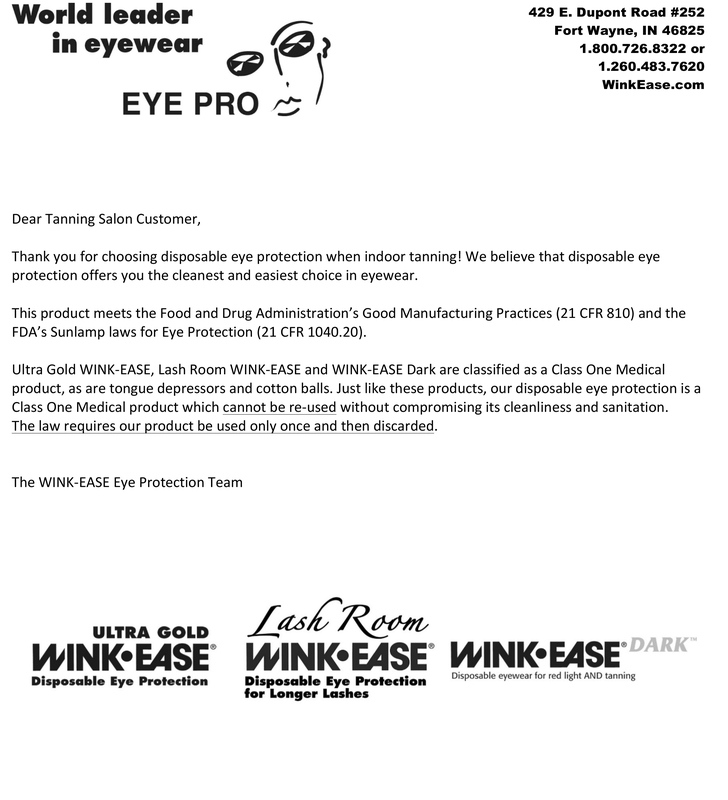 Eye Protection Articles | Eye Pro, Inc.
Sunless, Inc. is promoting safety in sunless tanning. “We want salons to be more safety conscious when it comes to sunless,” says Brandon Cardinal, VP of Sales and Marketing at Sunless Inc. – the largest sunless company in the world. Sunless, Inc. now offers printed signs that salons can post in spray-tan areas recommending that guests wear protection. The company’s safety packages also include nose filters, tech goggles, mouth filters, and disposable garments. “Our goal is customer safety and we want to safeguard our guests’ health,” Cardinal says. He recommends that every salon post signage about protection and make the disposable thongs, eyewear and nose filters available to each tanner. This Salon’s Got It Covered! I only had to chat with Melissa Latimer for a few minutes to realize she is very serious about eye protection at her salon. Heck, she’s serious about every- thing that has to do with tanning! This 38-year-old has built a successful tanning salon – Soleil Tan – an elite spray-tan salon, her own sunless solution distribu- tion company, and her own high-end skin care line. Melissa’s business is based in Carters- ville, GA. We met online, and she wowed me with her grasp of the importance of eye protection. Says Melissa, “We educate clients on the why of why eye protection is important. If guests forget or have misplaced their goggles, we give them a free pair of the deep-lash disposables. We like the style that allows for long lashes because so many of our clients wear lash extensions and they don’t fit in a normal pair of goggles or disposables. We simply say, ‘Hi Julie! We have you ready in Bed 2 – I just need to see your eye protection, please.’” Most salons do that, right? Read on for the difference! Posted in Eye Protection Articles, For Salon Owners, IST Eye-to-Eye Articles | Comments Off on This Salon’s Got It Covered! Do you struggle with ways to get your salon guests to wear eye protection for every tanning session? Is Your Salon’s Eyewear Compliant? Take this quick 10-question quiz and find out! 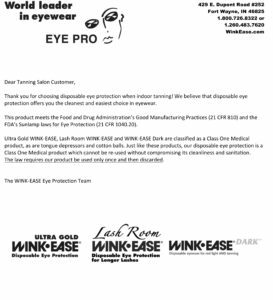 Posted in Eye Protection Articles, For Salon Owners | Comments Off on Is Your Salon’s Eyewear Compliant? How would YOU answer these questions from your salon guests? Read on for Part 2 of our summary of frequently asked questions to test your “eye-Q”!…. How would YOU answer these questions from your salon guests?